I’m just under four weeks from Ironman Coeur d’Alene. There is a part of me that is so ready to get this race behind me, particularly as I’m now training in the beginnings of crazy heat, and there’s another part of me that doesn’t understand how it could possibly be only four weeks out. I know we sign up a year in advance, but wasn’t that just yesterday? I have high hopes for this race, mostly because I’ve been more committed to training than perhaps ever before. Last year, I was diligent leading up to Ironman Canada, but this year is just different. I’m more focused, and my program is more guided. One huge help is that I have lots of people joining me for my workouts. I’ve had people to swim, bike and run with throughout my training. There are days I’m on my own, like this past Sunday when I did my ridiculously long spin session and run. But usually, I have company. Jenny C. spins and sometimes swims with me. Catherine bikes with me. Kerry, Jenny L., and Sommer run with me. We took this picture right after our run this morning. That’s Jenny in the green, Kerry in the tank top, and Sommer with the dimple. 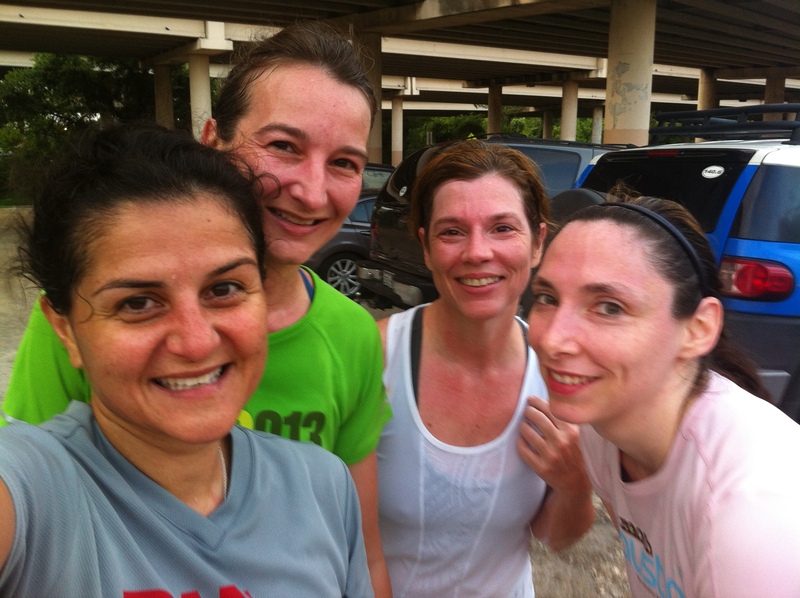 These women are why I am able to get up at 5:10 in the morning twice a week – or often three times a week – to run on the trails. They run with me in the dark, and they have the entire time that I’ve been training for this race. They ran when it was cold, and now they are running in the heat. I will carry them with me every step of the run in Coeur d’Alene. I was thinking that, after my race, we might take a short break from running and meet up for margaritas instead. But no. I love running with these girls. Race or no race, we’re running. I’ve said those words – or some variation of those words – a bunch over the last six or seven months. If it were up to me, we’d be together. If it were up to me, I’d be there, not here. If it were up to me, I’d be doing that, not this. I read something today that made me realize I shouldn’t say those words again. Last night, a dear friend gave me a book called One Thousand Gifts by Ann Voskamp. She described it as a book about gratitude. I’m not very far into it, so I can’t say that she’s right or wrong in that characterization, but I do know that Chapter 1, which I read tonight, just about knocked me over. That’s the natural reaction, isn’t it? To say, effectively, I would make this better for you. Or I would make this better for me. His reaction to her, however, was anything but natural. He told her a Bible story about a king who was given extra years of life because he asked for them. In those years, he fathered a son who did a great deal of evil. He’s watching that sea of green rolling in the wind. Then it comes slow, in a low quiet voice that I have to strain to hear. He’s right. We don’t know. I don’t know. I don’t know what a different story would hold. So rather than dwell in the made up possibilities of the other story devised by me, one whose judgment I know is less than perfect, I want to take a lesson from this man and embrace fully and trust the story I’m living. What is that story right now? This weekend, I spent a lovely Saturday in my home. I spent Sunday spinning for seven hours, running for an hour, and enjoying a wonderful home-cooked meal prepared by a friend who cares enough to want me to experience more gratitude in my life. Then today, this holiday Monday, I went for a much shorter bike ride, got to hear my niece play the piano, enjoyed an outdoor gathering with Erin and some great people I’ve met through her, spent a bit of time wandering through Book People, hung out with Mom and Dad and relaxed this evening at home. There are other things I might have injected into this weekend, if it were up to me. But it wasn’t. It isn’t. It’s up to one much greater than I am. Thank heavens. Somebody was giving me hell today about liking country music. He characterizes country music as involving ignorant, redundant and one-dimensional themes. His criticism sounded to me a bit like unjustified music snobbery, but it got me thinking. Why do I love country music? Here are my thoughts. Songwriting doesn’t get any better than Bruce Robison. Have you listened to My Brother and Me? What about Travelin’ Soldier? Wrapped? These are all great songs. Country music has a sense of humor. I like that we can joke about alcohol causing a few births and the significance of the red Solo cup. Is there anyone out there who feels like they laugh too often? Country music also has the capacity to touch on serious subjects. Anger? Not Ready to Make Nice. Loss of the love of your life? Don’t Take The Girl. How kids, even initially unwanted kids, change your life? There Goes My Life. Being true to yourself? Follow Your Arrow. With country music, far more often than not, you can understand what they’re saying. Country musicians articulate clearly. It’s not just about head pounding music or a catchy beat. The story being told matters. It frustrates me to listen to other music and not be able to make out the words. If I’m not in the mood for words, I’ll listen to classical music or jazz, but if I’m listening to words, I want to understand them. I love thinking about love. Yes, much of country music has to do with love or heartbreak, which is ultimately about love. I think most music – country or not – has to do with love. But even if I’m wrong, is it wrong to dwell on love? To borrow from one of my favorite movies, isn’t everything we do in life a way to be loved a little more? It’s not that I don’t enjoy other music. I do. I am a satellite radio girl. Though I focus on The Highway, I also listen to the 70s, 80s, and 90s stations, the Coffee House, and the Broadway station. I have 30 different stations programmed, and I listen to all of them at different times, but more often than not, I choose country. And if you ride in my car, I will make you listen to country too if you give me hell about it. Otherwise, I’ll let you pick the station. So if you don’t want to listen to country, you’d better be nice. I’m going to veer off the training track for a moment to brag about my day. Then I’ll return to it to brag about my day’s workout. Can you tell I’m in a good mood? I spent the bulk of today at the Marchesa Hall & Theater watching Before Sunrise, Before Sunset, and Before Midnight, which are directed by Richard Linklater and star Ethan Hawke and Julie Delpy. The third in the trilogy opens this Friday, so if you haven’t seen it yet, no problem. Just rush to the nearest theater on Friday. But if you haven’t seen the first two movies, what’s wrong with you? Go watch them now. I use Before Sunrise and Before Sunset as a test. Do you hate those movies? Then I’m afraid we can’t be friends. Do you not love those movies? Then I’m afraid we can’t date. Sorry. I have my standards, and I believe that anyone who doesn’t love them lacks a certain sense of romanticism that I want in a partner and anyone who hates them is lacking a sense of humanity that I insist on in a friend. Before Sunrise is about an American man who meets a French woman on a train in Europe and spends one night wandering the streets of Vienna with her. (Want to know why I am gifting myself a trip to Vienna for my fortieth birthday? This movie is why.) Before Sunrise picks up nine years later in Paris when the man is on a book tour for a novel he wrote based on the one night in Vienna. Before Midnight enters the scene another nine years later. I saw the movie in March at South by Southwest, and I saw it again tonight. I’d tell you what happens, but I want you to experience the story for yourself. So please, watch the first two and then see the third when it opens on Friday. I thoroughly enjoyed my Before Trilogy marathon today. The movies are perfect, but the best part of the day, for me, became about people. First, Richard Linklater and Harry Knowles of Ain’t It Cool News did an incredible hour-long Q&A after the first film. Who has ever heard of an hour-long Q&A? Both men were so engaging that I felt like I was listening in on a private conversation. What a gift that hour was. Second, I got to see Before Midnight with my dear friend Walter. We met at a movie and developed a friendship that grew largely around movies and music, but mostly movies. One of my favorite Walter memories is that, after a screening of Closer, we sat in my car for so long talking that we drained my car battery. (I think I had turned the key in the ignition just enough to start the heater but not enough to start the car. I thought we’d be sitting for ten or fifteen minutes, but we sat for hours. Oops.) He is also the friend who lovingly challenged me to travel – to take trips that involved being away from Austin for more than five or six nights. I love Walter, and I love his wife and kids. I’m grateful for the time with him and for the opportunity to talk about one of my favorite movies with a dear old friend. Pretty great, huh? Did I mention that, between the second and third screenings, I did a track workout and ran a 4:11 800, which was 3 seconds faster than last week? I’m loving seeing my progress. After a day like today, you’d think I’d be exhausted, and I am. But I’m also terribly energized. Today was a gift. There were lots of other things that I could have or even perhaps should have been doing. But I think I spent it perfectly. Now off I go to sleep and perhaps to dream of love and being super speedy in races. What a Difference Good Sleep Makes! Last night, I went to an interesting panel discussion on magazine writing with Texas Monthly’s Michael Hall, novelist Sarah Bird, music critic Chuck Eddy, and People Magazine’s Alicia Dennis, but I could not for the life of me keep my eyes open. I left when the Q&A started, which is not like me, especially considering the quality of the panel, but I had to. I went straight home and by ten, I was out. Though I haven’t been sleeping well, I slept solidly until eight this morning. After ten hours of sleep, I’m feeling like myself again! This sets me up for a good weekend. I will swim tonight. Tomorrow, I’m doing the Real Ale Ride. Sunday I’ll do a track workout. I’m looking forward to trying to beat my 4:14 record on 800 meter repeats. There was a time forever ago when I could function well on three, four or five hours of sleep. In boarding school, I remember pulling an all-nighter when I wasn’t happy with a paper I’d written for a class I took called Personhood and Belief. It was no big deal. During college, I remember sleeping little during the week and catching up on weekends and never giving my shortage of sleep a second thought. Even in my twenties, I could go out mid-week a couple of nights in a row and be just fine at work. In my thirties, I felt my ability to function on little sleep fade a bit. Two or three late nights one after the other would do me in. Now, at nearly forty, one night was all it took to turn me into a worthless zombie. I’m definitely getting older. Rather than be bummed by it all, I’ve decided to milk the whole needing sleep thing. I love to sleep. My bed is one of my favorite places in the world, and I don’t spend nearly enough time in it. Twenty years ago, if I’d said, “Sorry, that’s too late for me because I need my sleep,” I would have been lying. Today, I can say that. And I will. I consider that power a perk of old age. I’m dragging today. Actually, I’ve been dragging all week. I had a work session on Monday that ran late into the night. Normally, that wouldn’t be a big deal, but I got up early Tuesday morning to run, which meant getting less than five hours of sleep. Then Tuesday night, I couldn’t fall asleep but I managed to sleep in a bit on Wednesday morning. Then last night, I went to bed early but couldn’t sleep, so it was another five hour night. Today, I’m just tired. My tiredness affected my run this morning. I actually did less than half of my run. I was supposed to run for 2 hours and 45 minutes, but I didn’t have it in me. My head hurt, and I felt heavy, partly due to the conditions. It was muggy. I ended up stopping after 6.66 miles. On a regular day, I would have run a bit more to hit 6.67 before stopping, but I didn’t even have that in me. After cutting the run short, I went home to clean up rather than going to the gym. I just needed some time to sit. I’m hopeful that I will fall asleep early tonight and wake up feeling better tomorrow. Dragging is no fun at all. I did read something interesting today though. I read Jordan Rapp’s blog. Today, he posted about St. George. He’s an incredible athlete. I’ve written about him before. He’s said some things in speeches I’ve heard that really spoke to me. The thing he said in his blog today that helped me was that he had to walk part of St. George. I was feeling bad about having to walk, but even Jordan Rapp walked some. That tells me first that St. George was tough for even the best athletes and second that we all have bad days sometimes. At St. George, my bad day and I were in amazing company. I feel better and better about St. George the more I think about. And I’m hopeful that tomorrow, I’ll just plain feel better.